It just seemed to go nowhere. Out in the open acreage, I came upon a wooden walkway. Surrounding it were thick weeds–some green, some brown and lifeless looking. Who had built it and when? Where was it intended to go? Many questions come to my mind as I remember the boards that were carefully placed at one time. Now, those boards are being consumed with sticks and vines, left alone to eventually rot in the sun. Looking at the photograph brings a plea from my heart. I don’t want my life to ever be a "could have been." If I continually look to God for my purpose, allowing Him to use me, I will be like a walkway. 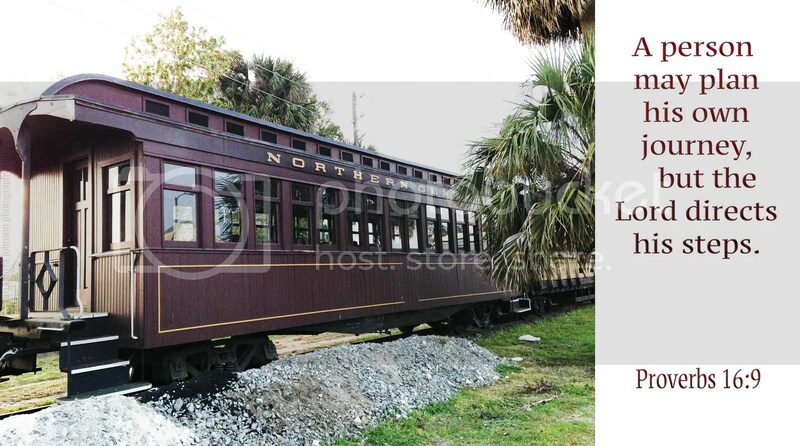 Not one that is abandoned, but one that is traveled. One that leads to a specific destination. One that provides a path that leads to truth. Isn’t that what you want, as well? Don’t you want to be available to those who need your encouragement, your listening ear and your faithful prayers? Wouldn’t you hope that others would see your faith in God and join you in the journey drawing closer to Him? Isn’t it the desire of your heart to know God’s purpose for you each day and to be at work fulfilling it? Those who choose not to acknowledge the existence of God do so, I suppose, because they feel that is right. It is the way they have chosen, but its end does not lead to life, but to death. 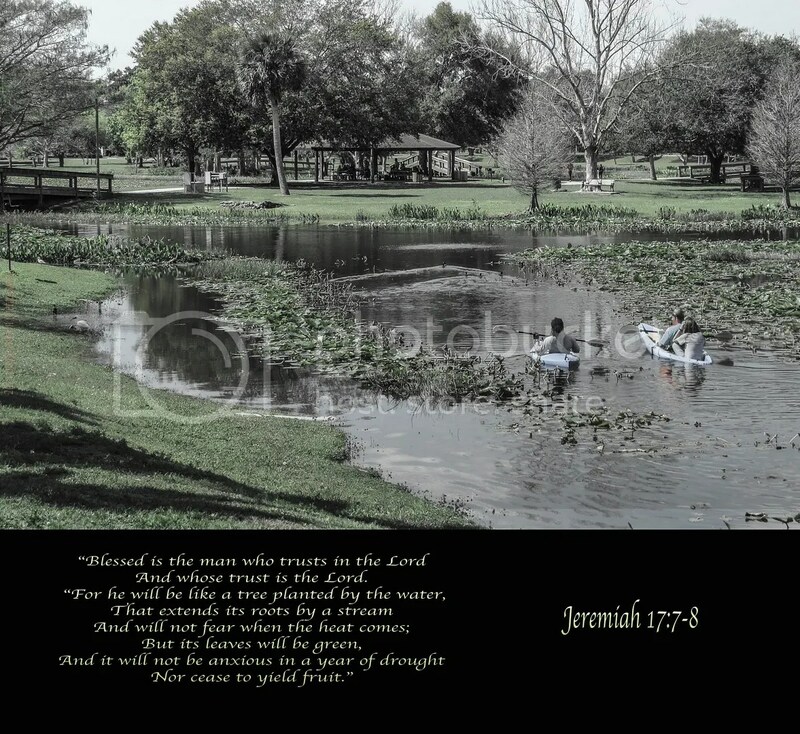 A life that could have been lived for God—– or a life that was lived for God? 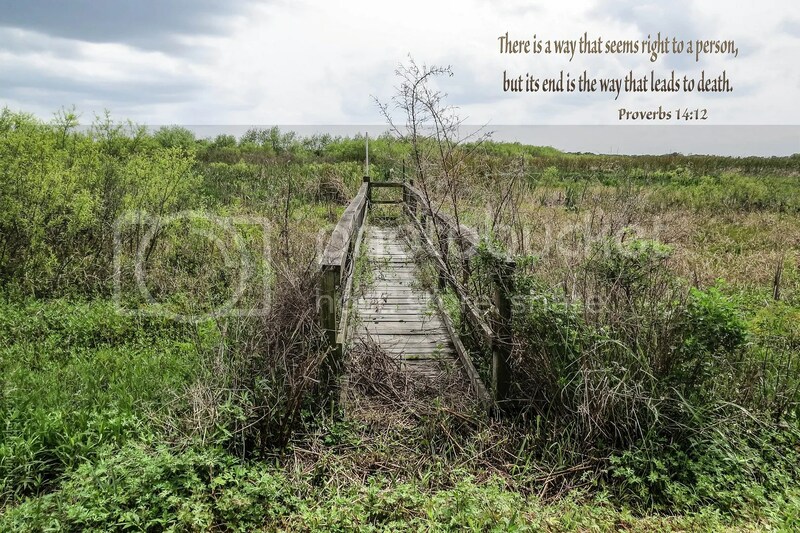 but its end is the way that leads to death. I saw the illustration on the internet. It was just a single cartoon—a drawing of a butterfly sitting in the driver’s seat of a convertible and talking to a policeman. The policeman is holding the driver’s license of the butterfly. The identification picture on the license is of a caterpillar. To ease the policeman’s confusion, the butterfly simply states, "It’s an old photo….."
Humorous as it is, it is actually true. Any living butterfly has had a past. That past involved being a worm-like creature that had no wings and couldn’t fly. We are like that, too, even though we don’t go through a caterpillar stage. 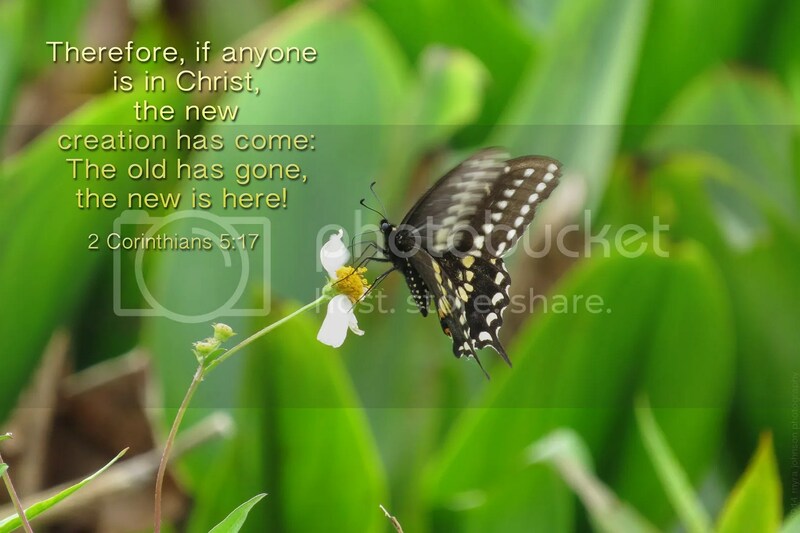 When we become a believer in Jesus, we change. If we are stopped by a policeman while driving, our licenses won’t reflect any differences. Yet, the change is more profound than any photograph could show. The old "us" without Jesus is gone. The new "us" with Him is here. 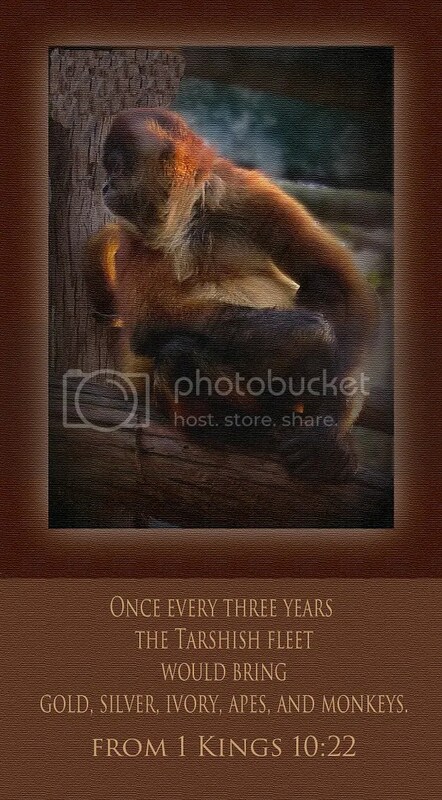 We are no longer bound to the confines of crawling on trees and bushes. Walking out in the nature conservation preserve, I came upon some water lilies. A bloom was strikingly white as it had unfolded around the green pads. There is a song about Jesus that I first heard as a child that calls Him the "Lily of the Valley." The line, "He tells me every care on Him to roll," is one I need to be reminded of often. Do you have some worries and cares that need to be given to Him today? The light was almost gone from the overcast clouds above. It was chilly outside and the wind blew in waves around me. Tall and dark, I had noticed a single cross that had been erected in the front lawn of a church. I pulled into the empty parking lot and walked through the green grass over to it. As I looked up at the pieces of wood and the purple material draped around it, my thoughts didn’t seem to form any mental words. So much is known deep within our souls when we consider the cross where Jesus died. Pondering that one statement is immeasurably important. 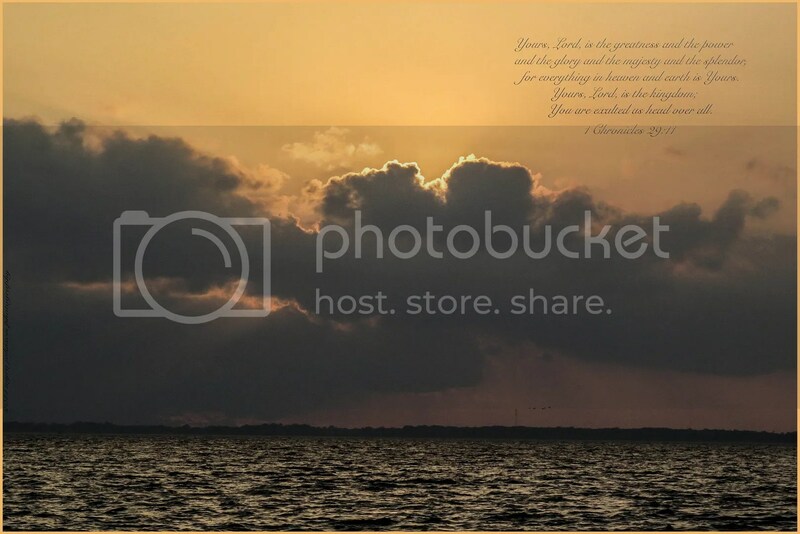 Rising from the dead, He returned to Heaven and He has prepared a place for those who love Him there. It was soon to be dark outside as I stood near the cross. Whether day or night, the light of His love remains forever. I wouldn’t have thought it would have had quite the impression on me that it did. 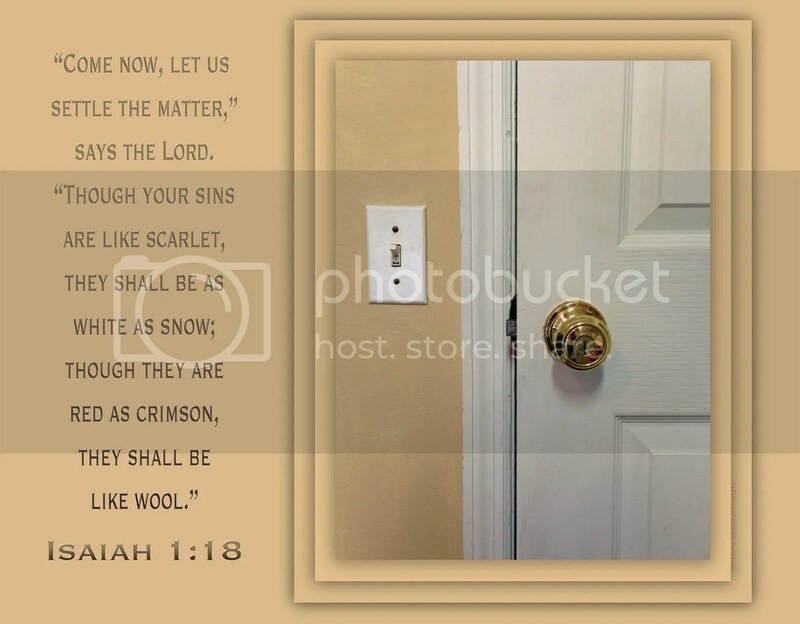 The door that leads from our garage into the kitchen is painted white on the side facing the kitchen and on the side facing the garage. The kitchen side is kept up pretty well. I either wash it with a cloth or paint it to keep it clean and presentable looking most of the time. The garage side is a different story. The clothes washer and dryer are in the garage. The heater for our home is housed there, too, along with large power tools, bicycles, dog food, sports equipment and various boxes of things too precious to throw away. Generally, the garage is not as clean as I would hope the rest of the house to be. Whenever I am cleaning or painting woodwork in the house, I usually neglect to consider painting the door that faces the garage. Because of that, it had become quite dirty. Almost grimey looking near the handle. The wall next to it had not been cared for either, in a long time. Suddenly, on a whim, I decided to change all that. With paint brush in hand, I made what was unpresentable, presentable. What was so very dirty is now covered with what is clean. And what do I find myself doing? Looking at the door and admiring its beauty and cleanliness. Each time I enter the kitchen from the garage, there is a sense of order and respect. It somehow even inspires me to clean or paint other areas inside the house, restoring them to a better state. The sin in our lives makes us dirty and unpresentable. It harms us and we begin to deteriorate. God has provided a remedy for the pitiful state that we are in. 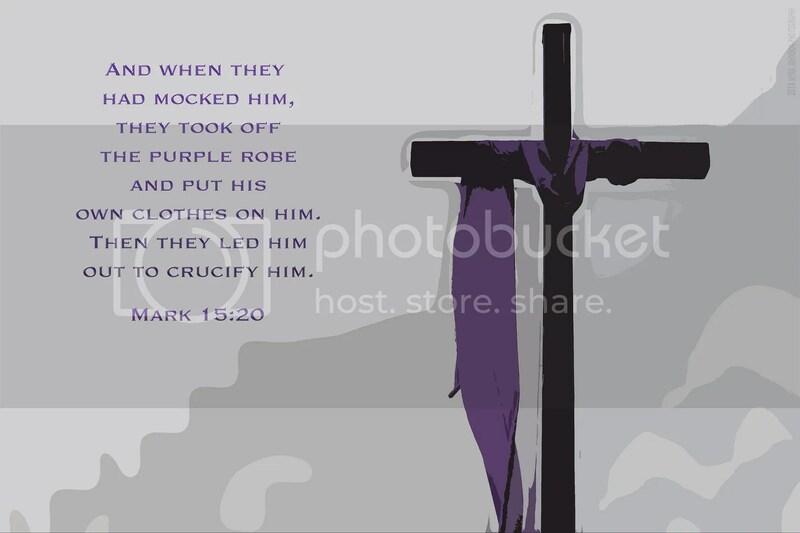 When His Son, Jesus, died on the cross, He paid the penalty for our sins, purchasing eternal life for us. Even though we were dirty and unacceptable, we can be forgiven of those sins. We can be covered in His righteousness and made clean. Asking God to forgive us of our sins is the most important decision we will ever make. I wouldn’t have thought it would have quite the impression on me that it did. My friend was seemingly frustrated because she was experiencing a particular financial need. I told her to pray and ask God to provide for her and to look for how He was working. In my own life this past week, I have seen evidence of God’s work. An unexpected phone call and visit, a change in attitude. A broken appliance and then the provision of a different one. A friend giving much needed Christ-like advice. God is faithful to provide for us in many, many ways. He knows exactly what we need, as well. We may not even understand what we need, yet He does. Your steadfast love, O Lord, is as great as all the heavens. 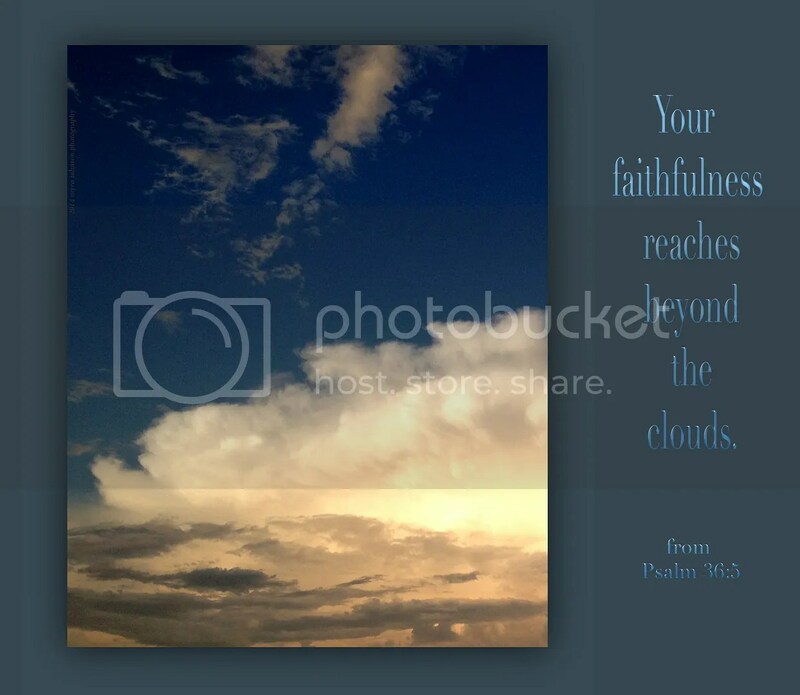 Your faithfulness reaches beyond the clouds. We can trust God—-He is faithful. The sun had been covered by thick clouds. As I watched in the last few moments before it would disappear beyond the horizon, the clouds separated, revealing the perfect circle of light. Christ was alive when the world began, yet I myself have seen him with my own eyes and listened to him speak. I have touched him with my own hands. He is God’s message of life. This one who is life from God has been shown to us, and we guarantee that we have seen him; I am speaking of Christ, who is eternal Life. He was with the Father and then was shown to us. Again I say, we are telling you about what we ourselves have actually seen and heard, so that you may share the fellowship and the joys we have with the Father and with Jesus Christ his son. And if you do as I say in this letter, then you, too, will be full of joy, and so will we. 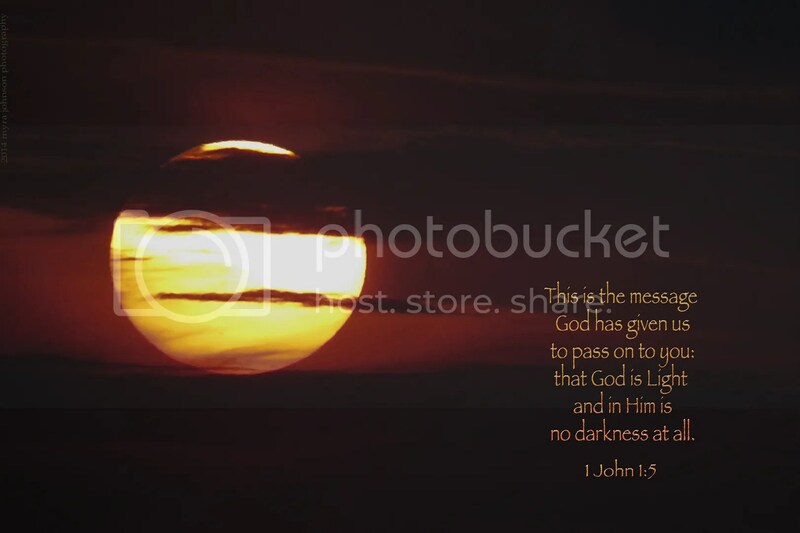 This is the message God has given us to pass on to you: that God is Light and in him is no darkness at all. So if we say we are his friends but go on living in spiritual darkness and sin, we are lying. But if we are living in the light of God’s presence, just as Christ does, then we have wonderful fellowship and joy with each other, and the blood of Jesus his Son cleanses us from every sin. While walking through a park in a nearby city, I noticed some wildly pink blooms. Coming closer to investigate, I made some photographs and moved on. After looking at the photos, this one in particular shows quite a contrast. To the left, a tree stands bare. On the right, there are loudly vivid, pink blooms, screaming with color. 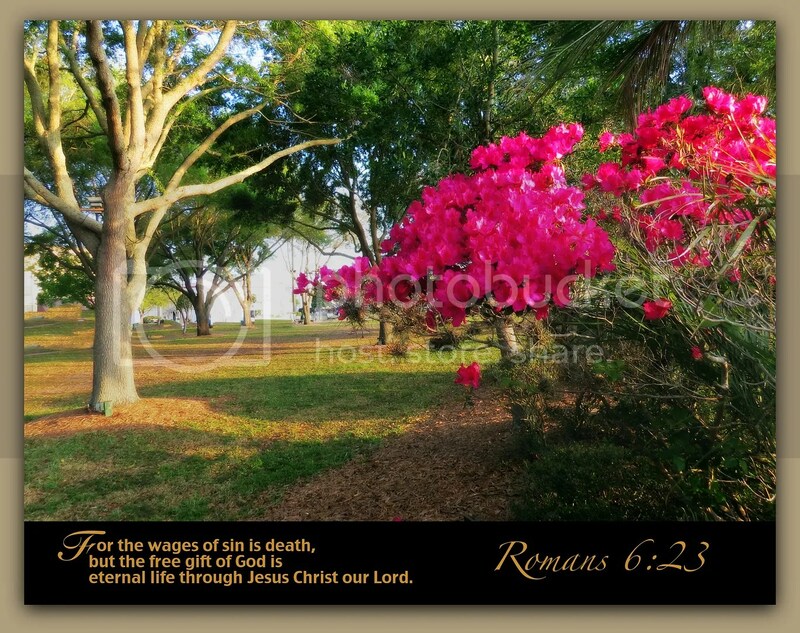 "For the wages of sin is death, but the free gift of God is eternal life through Jesus Christ our Lord." Those who have accepted the free gift of God work side by side with those who have not. They go through each day with others at school or at home. Those they see at a store or a ballgame. Even those at a party. Even those at a funeral. One group of people will live eternally with God in Heaven. The other group will not. Comparing your eternal existence with the barren tree or the vibrantly pink blooms, which would describe your destiny? If you would like to accept God’s gift of eternal life, pray and tell Him so. Ask Him to forgive you of everything that has displeased Him. Tell Him that you believe in His Son, Jesus. Commit your life to live in gratitude to Him, listening for His voice to guide you. It’s not too late…..pray right now. Exactly what is it that I have to offer? What are my talents and my resources? What strengths do I possess? Whatever my answers to these questions may be, a transformation happens when what I have to offer is accompanied by what God has to offer through me. If I give of my time, He is able to increase its value and effectiveness. In using whatever talents God has given me, He can expand my efforts in ways I could not have ever imagined. Whatever resources I may possess may be doubled and redoubled as He provides for His will to be done. God is great and powerful. As I seek to offer what I have in His service, what I have is not really important. It’s who God is, that matters. 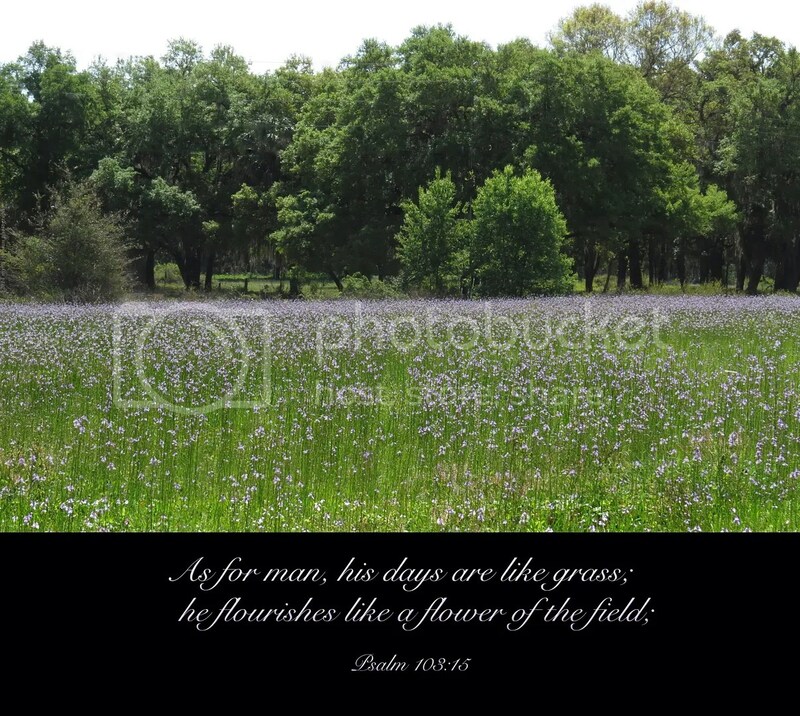 He waters the earth to make it fertile. The rivers of God will not run dry! He prepares the earth for his people and sends them rich harvests of grain. 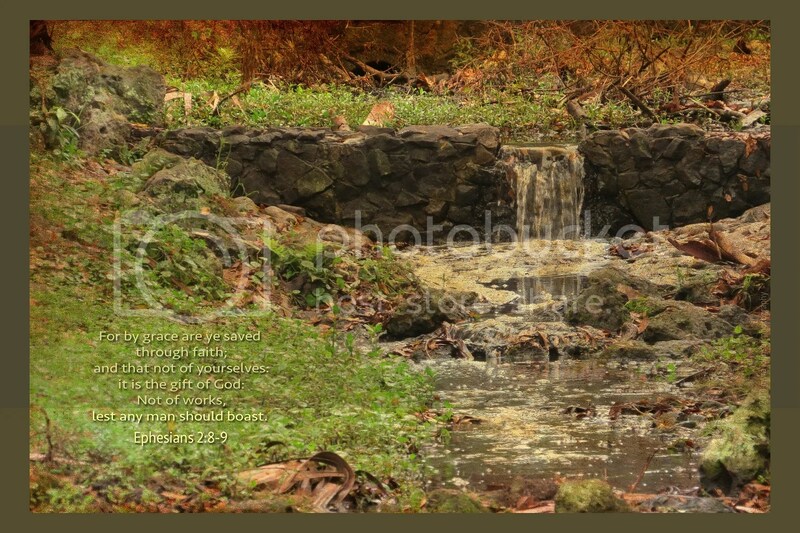 He waters the furrows with abundant rain. Showers soften the earth, melting the clods and causing seeds to sprout across the land. 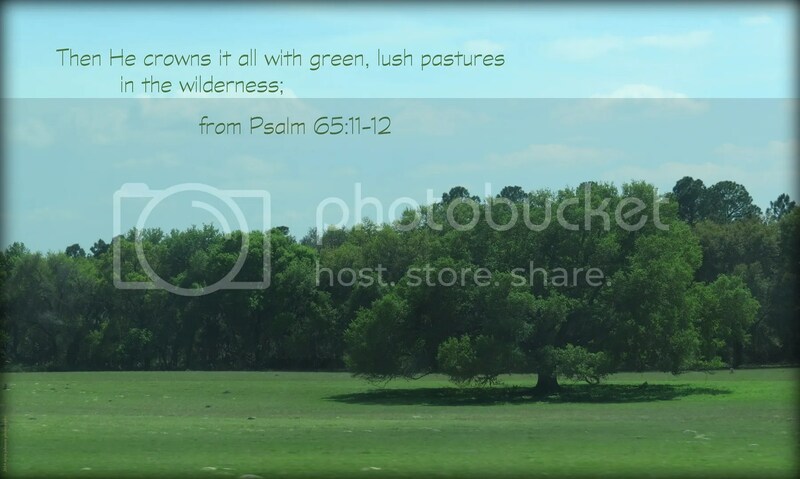 Then he crowns it all with green, lush pastures in the wilderness; hillsides blossom with joy. The pastures are filled with flocks of sheep, and the valleys are carpeted with grain. All the world shouts with joy and sings. As the day was drawing to a close, my bassett hound was lying near the front door, looking outside. The soft orange colors of sunset were bathing the grass in the yard with a warm glow. I needed to stop what I was doing and take her for a walk. As we strolled along the street stopping to look at one interesting area of ground and then another, we came upon a small patch of weeds. Weeds are certainly not uncommon, but this patch had small yellow flowers blooming in several places. Getting my cell phone out, I took a picture of one of the blooms. Delicate and lovely, yet strong and hearty as a weed usually is. The day had been full; my husband had undergone surgery on his arm to further promote healing from a broken bone. Hours before, I had prayed for him while in a waiting room, trusting that God would be his help. It was God that brought my husband out of a successful surgery. It was God that created the tiny flowers of a weed. He created all that is in existance and we have the wonderful privilege to come to Him in prayer. What would it be like to hear an instant playback of our words, seconds after we’d said them? How would we feel if, at the end of the day, we received printed pages containing every word we had uttered? We would certainly be happy when we recalled kind words, loving words and words of encouragement. But what about the other words? I would want to stop the playback or fold up the papers when confronted with those types of words. When we were in school, our written words were often submitted to the teacher for evaluation. Often, they would be returned to us with red marks and suggestions for doing better the next time. When our words are not what God would’ve wanted us to say, we can ask for forgiveness, determining with a sincere heart to replace them with those that would please Him. 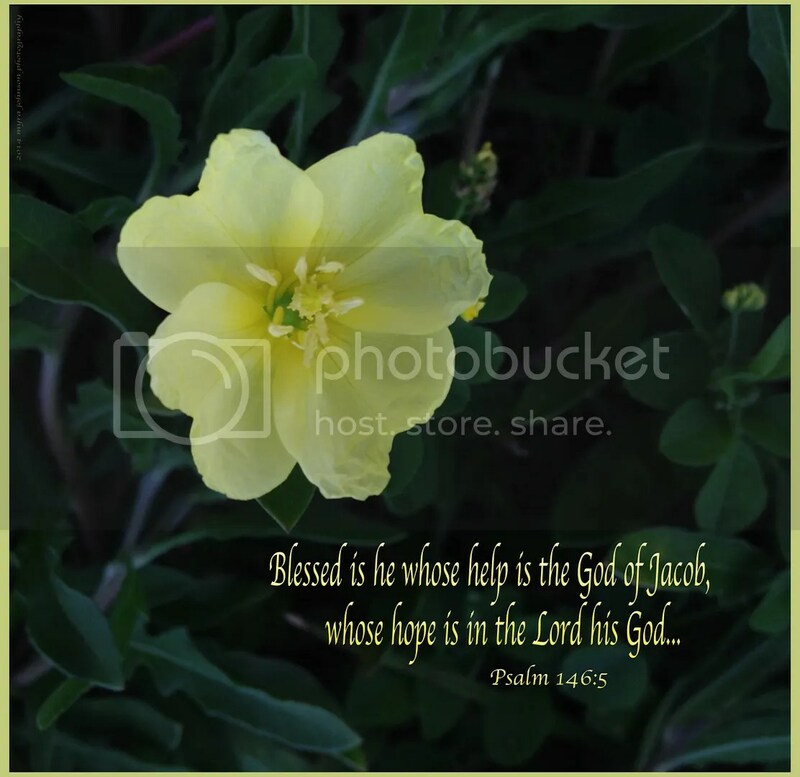 God is the source of all hope. Do you want to be filled with joy? Through faith in God, you can be. Do you want to experience peace? God brings peace to your soul. May God, the source of hope, fill you with joy and peace through your faith in him. Then you will overflow with hope by the power of the Holy Spirit. I believe those were the words I was thinking when I went to sleep last night. In recent weeks, I have read a devotional that reminded me of that fact. Trusting in those words can bring me comfort. 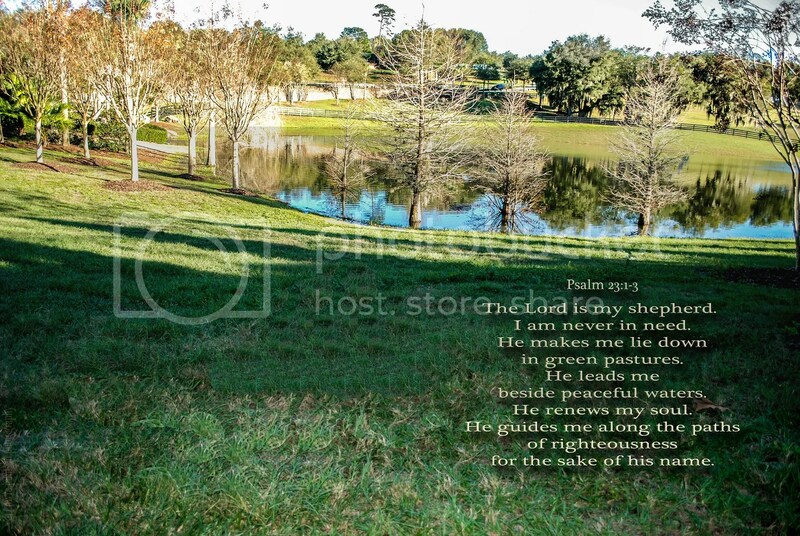 As I looked at the online home page of a scripture reference website I visit often, today’s featured scripture passage was the first three verses of Psalm 23. Do you ever long to just get away and find a green pasture? We can find such places to go if we have the time and money to get there. 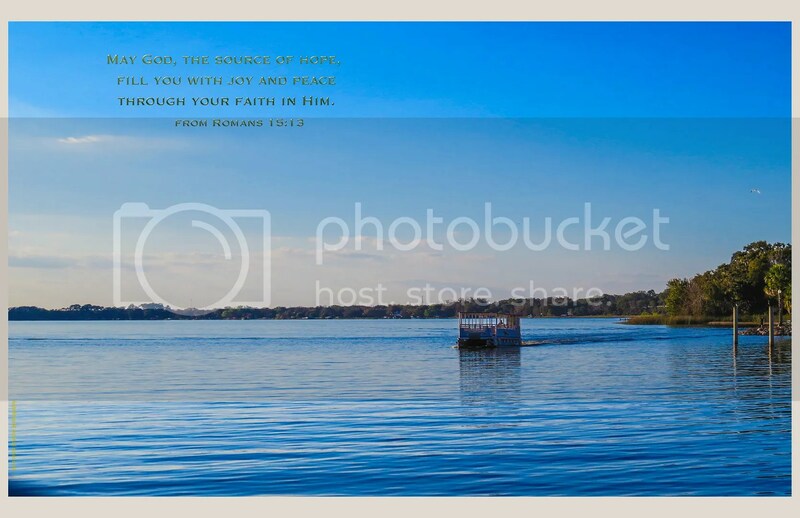 God has spiritual pastures to lead us to, however, with soul-renewing peaceful waters. Sometimes, we just need to go to sleep praying, "The LORD is my shepherd…." We saw the train standing still on the tracks by the lake. Deciding to take a closer look, my husband pulled into a nearby parking lot. The old engine with the cars lined up neatly behind it had drawn a small crowd. A man with a very nice camera stood framing a photo near the engine. A family with children looked on, as well. What is it about trains that makes people want to stop and look? Is it the dream of travel? Driving back home from a morning photo session in a nearby city, I passed a sprawling field—several acres—filled with lavender wildflowers. The sight of it was totally unexpected. It was tucked neatly a little ways from a fairly crowded area and located near a large hospital. I found myself turning the car around and heading back to photograph this gorgeously delicate field of beauty. I was able to turn down a country road that bordered the property and park the car. Watching out for snakes, fire ants and poison ivy, I began my trek into a pale purple world. The blooms seemed endless as I joyfully took one shot after another of the thousands of rows swaying calmly in the breeze. Understanding that they will not be there indefinitely, I count it a blessing to have experienced such lovliness. Like wildflowers, we, too, will not remain on this earth indefinitely. What we do with our time here is so very important. Are we living for God in the years we are given? 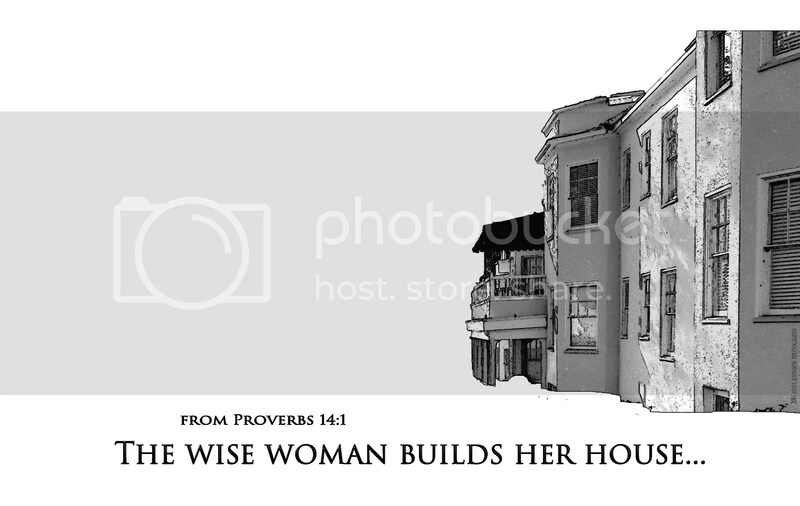 "The wise woman builds her house…"
I suppose that means a wise woman would consistently make beneficial decisions regarding her family. Who wouldn’t want to have a goal to "build their house"? "…but with her own hands the foolish one tears hers down." Bringing this possibility into the picture strikes me with uneasiness. The verse is both an encouragement and a warning. If the foolish one tore her own "house" down, that must mean that she had one. Yet, through foollish action or possibly inaction, what she had built was torn down. I need God to guide me in making wise decisions. Without God, I can’t "build" a house—-or keep from tearing it down. Lord, please give me the wisdom to build my house as You would have me to. Please give me the wisdom not to tear it down. Who do you know that is wise? Almost anyone could probably name someone they know that just seems to have it all together. If there’s a problem, they just seem to make the right choices. They can see past obstacles and look ahead to anticipate correct action. People like to talk to them, because they make so much sense. God gave wisdom to King Solomon. In fact, He made King Solomon very wise because Solomon had asked God to give him discernment. Since God told him this, I believe that there has never been anyone more wise than Solomon. King Solomon was greater in riches and wisdom than all the other kings of the earth. The whole world sought audience with Solomon to hear the wisdom God had put in his heart. I wonder what it would have been like to have lived under his rule, seeing all the gold and silver, looking at animals from far away…. What would it have been like to have spoken to him about any matter? King Solomon has been gone from this earth for a very long time. God is still on His throne in Heaven, however. You and I can ask God to give us wisdom. Wisdom to make correct choices. Wisdom to understand all that is swirling around us. We can ask Him for a discerning heart. There is no greater wisdom than that which comes from God. It wasn’t a human chess game. 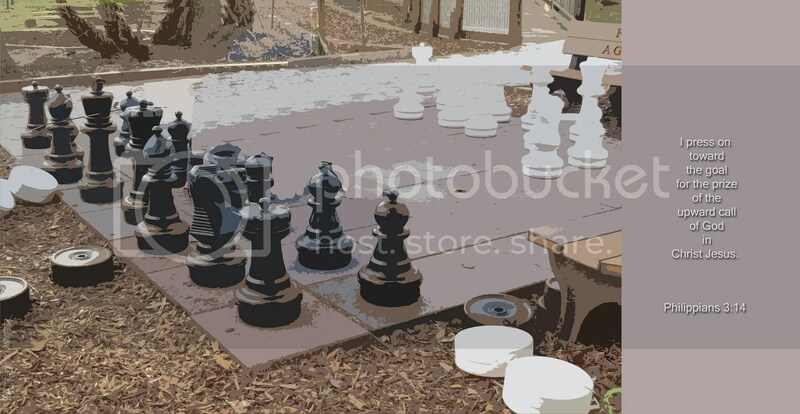 I’ve seen those before–a large, outdoor chessboard with real people as the chess pieces. The chess pieces were probably about two feet tall. They were placed happily on the room-sized board on the ground. Does the size of the pieces make it easier to consider winning moves? Was it a statement of art to suggest that some people consider chess, or perhaps any game in general, to be of greater importance than it really is? Maybe it was crafted just for fun. Something to create laughter as onlookers pass by. One thing’s for sure–you couldn’t quite miss noticing the game if you were walking anywhere near it. Although attention to the detail of a regularly sized chess set might go unnoticed, here it was made large enough to see. The chessmen silently issue an invitation. "Come on! How about a game of chess?" There is a certain draw to the board. Life really isn’t a game, but the moves we make with some very large decision pieces will begin to shape a particular outcome for us. If we’re not carefully considering each move, we may find ourselves with only a few choices. We may even find ourselves with no choice at all. God wants us to follow Him. Satan doesn’t want us to. As we advance across the board, we come up against obstacles. Knights that threaten us a move or two down the road. A bishop looming on the outer edge. Still, we can’t give up, even in the face of opposition. We must keep looking to the goal. 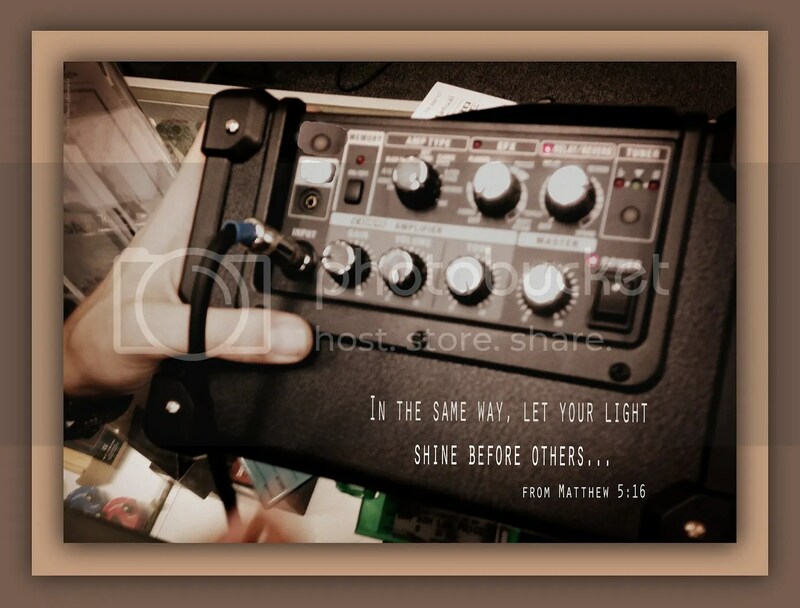 A couple of weeks ago, I bought a new amplifier and microphone to use with a musical instrument. With it, I can play or speak softly and still be heard in a very large room or even in an outdoor setting. Without it, however, my voice will only carry so far. My instruments will only play to the volume level that my lungs will produce. There is a limit to what I can do alone. Apart from musical performances, I thought about this—what’s loud about me? 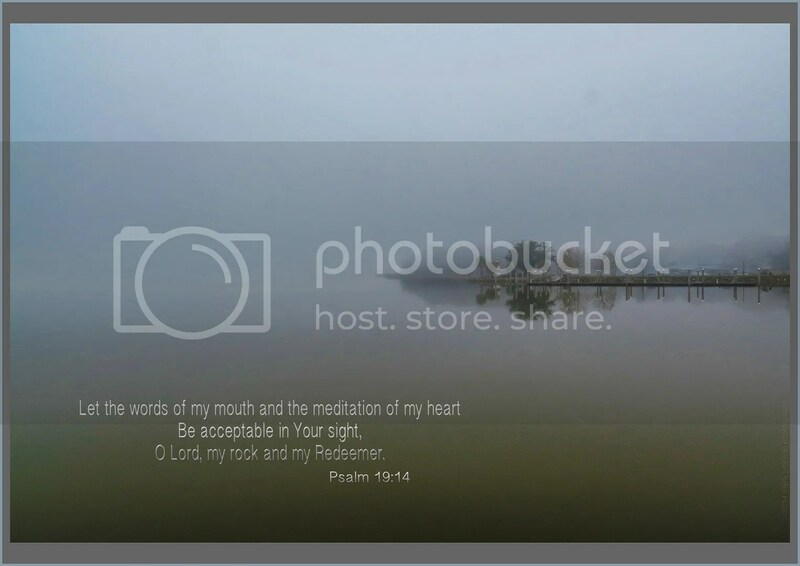 What is it that people see and hear in their hearts when they meet me and get to know me? Is my kindness loud or is my indifference? Is my giving attitude loud or is my selfishness? It’s likely that something in my life is being amplified and projected out to other people on a continual basis. Is it what God would want? What happens when you are shocked by something? I don’t mean "shocked" like being shocked by world news or the latest ratings of your favorite sports team. I mean "shocked" as in startled. Do you actually verbalize something? This afternoon, I was cleaning my kitchen. My kitchen suffers from the lack of planned cleaning, so it was quite a job. This was the kind of cleaning where I was even taking dried leaves off the plants that sit in the window. There is a piece of furniture in my kitchen that holds stainless steel cookware on racks. It also has a counter and a couple of drawers I use for towels. 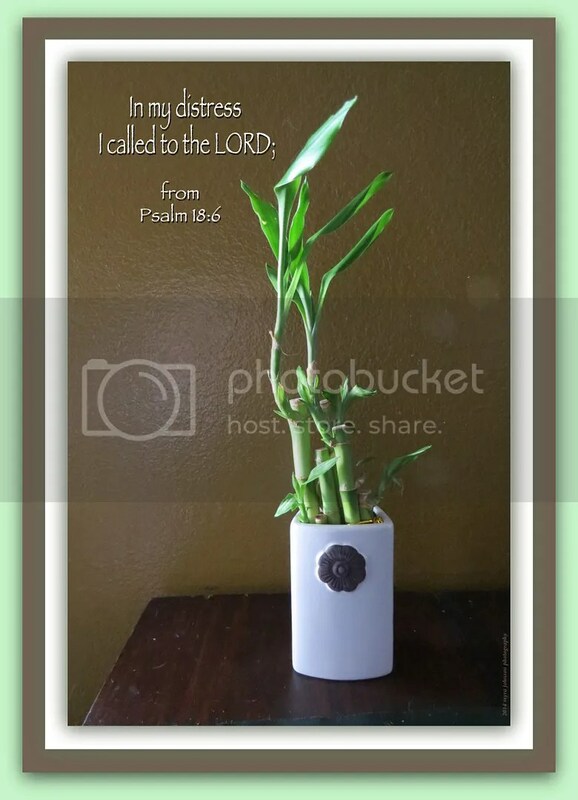 The counter has been home for a few weeks now to a bamboo plant in a ceramic glass vase. As I was using the broom to clean out some spider webs from a small wooden table, (I told you it really needed cleaning!) I heard a noise behind me. With the broom handle, I had accidentally hit the vase with the bamboo and knocked it over on its side. Before I could even tell what had happened, my mind knew something had. I’m not even sure the thought that I might have broken something had even formed before I cried out. The words came out, because somewhere deep in my soul I called to the One that I know is there for me when something goes wrong. Like a child calling for their Momma or Daddy when they fall and scrape their knees, my first thought seems to be God, even before I realize I am thinking of Him. There is nothing we can do to earn Heaven. No great acts of kindness. No sacrifice of time or money. Heaven is a gift offered to us by God, purchased by Jesus on the cross.